Tampon In A Teacup: The Force is with all of us. Back in November, blogger and adoptive mother Carrie Goldman found herself consoling a bullied child. With the rash of teen LGBT suicides, one might not be surprised. However, Carrie's daughter, Katie, was not a teenager being bullied for her sexuality. Katie, an adorable first-grader, was being bullied for having a Star Wars water bottle. Hoping to give her daughter some words of encouragement that weren't strictly parental, Carrie invited her readers to leave comments on her blog reminding Katie that being different is okay and that Star Wars is in no way "just for boys." The response to Katie's story was so overwhelming that Carrie had to shut down comment posting on that post and redirect her readers elsewhere to hare their stories. As with most blog-related causes these days, this one was granted a day of observance on Facebook. 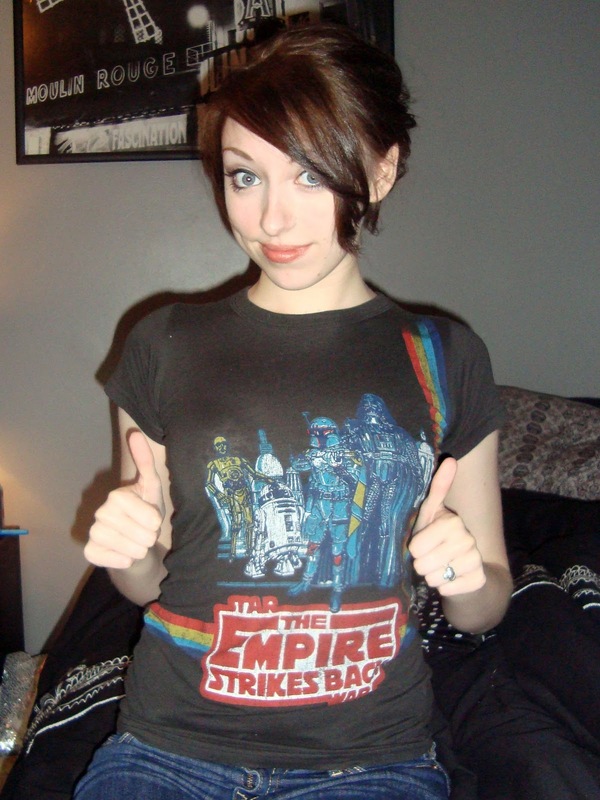 So welcome, friends, to Support Star Wars And Geek Pride For Katie Day. Today, anyone who wants to support Katie is encouraged to show geek pride in any way they can and, at the request of Katie's parents, donate toys to a charity. Today, I am proudly participating by wearing one of my two Star Wars t-shirts (I may change halfway through the day, JUST FOR FUNSIES!). I also want to participate by sharing a letter to Katie, as I feel Katie and I endured similar experiences as children. So hello, Katie. My name is Kait and I love Star Wars. I've loved everything about the Star Wars universe since I was a very little girl. The characters, the creatures, the grand adventures, it's all so much fun! When most girls my age were memorizing the lyrics to popular songs on the radio, I was memorizing the number of the trash compactor that Luke, Han, Leia, and Chewbacca jumped into to escape Imperial Stromtroopers (if memory serves me correctly, it is 32638something7). Because of this, I had a hard time making friends and connecting with the other girls in my class. I don't remember the kind of direct teasing that you have experienced, but I do remember feeling very out of place. No one wanted to talk about how brave Luke Skywalker was. No one appreciated the Yoda puppet that my parents topped our Christmas tree with. It was very lonely to be a Star Wars fan and a 10-year-old girl. What I want you to know is that even though I felt lonely as a kid, that loneliness did go away. By junior high, I had made friends with boys who liked Star Wars almost as much as I did. This must seem like a long time to wait, so my advice is this: don't wait. Don't put off happiness. Don't try to change who you are to please your classmates. I guarantee that if other kids can't appreciate you the way you are, they are going to make really lame friends. If you want to carry around a Star Wars water bottle, do it with pride! You are so blessed to have a unique personality and wonderful, supportive parents who allow that personality to thrive. Katie, I wish that I could meet you and give you the biggest hug and show you all the of the Star Wars stuff that I have collected in my life. I want to tell you that to me, you're like a real-life Yoda: an amazing inspiration in an unexpectedly small package. I want you to know that as girls, we can be girly and geeky. But most importantly, I want you to know that being true to yourself is the most important skill you can ever have. It's a skill that no bully can ever take away and I hope that someday you realize how impressive a human being you are to say you had that skill as a first-grader. So stay strong, stay true to yourself, and remember that The Force will be with you. Always. If you have noticed a sudden increase of visitors from Australia in your blog stats for today and thought WTF? Don't worry, it was just me engaging in a random act of blogger stalking. Sure, it's not usual for a stalker to make himself known to his subject but i'm kind of considerate that way. Like Hi I'm Craig and I will be stalking you today. Just pretend I'm not here and go about your business. Considerate right?! Otherwise you're just left wondering who, or what, has accounted for all those peeks in you're time line of the stats thingie. Oh. I almost forgot to tell you. I'm stalking you on twitter too.